Aquatic Invasive Species Services in St. Cloud, MN Lakes Area - Limnopro Aquatic Science, Inc.
Once invasive species become established in a lake, they are virtually impossible to eradicate. The objective of early detection monitoring is to locate pioneer populations of AIS newly introduced to lakes. 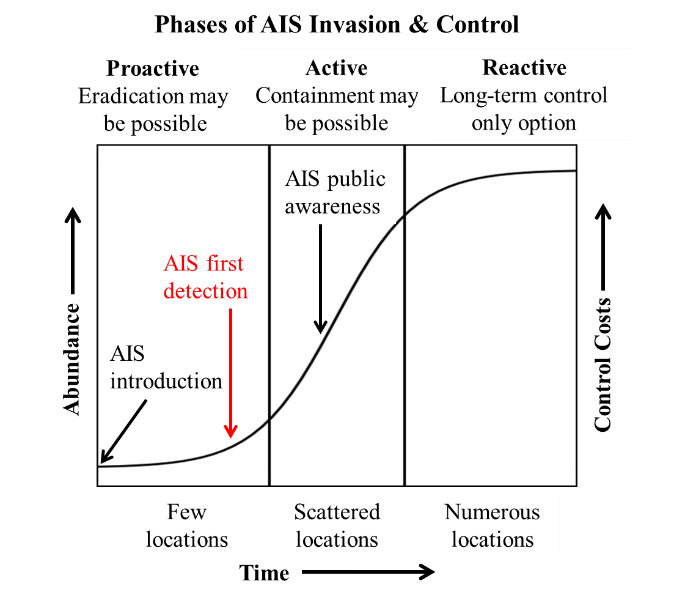 Finding AIS early increases the chance that eradication or containment is possible at a lower long-term control cost. Newly discovered AIS could allow for implementation of a rapid response strategy, lead to an assessment of abundance and frequency within a waterbody and/or an evaluation of management activities. Our AIS Early Detection Survey is designed after a program designed by the Wisconsin DNR to do just that, find them early. We offer three levels of service to find starry stonewort, Eurasian watermilfoil, zebra mussels, spiny water flea, rusty crayfish and more. Call or email for current pricing. AIS Risk Assessment: We can help prioritize which lakes in a county are at a higher risk for spread (colonization) and which lakes foster livable conditions (suitability). AIS Mapping: For lakes with invasive species, we can determine where hotspots are within the lake and/or map populations for chemical and/or mechanical treatment. AIS Experiments: We offer technical ability that enables us to evaluate the success of your approach to combating AIS.